Server Fault is a site for system and network administrators needing expert answers related to managing computer systems in a professional capacity. Does this not also include datacenter design questions, such as how do I layout my hot & cold aisles, or by how many inches should my floors be raised, or should I worry about metal whiskering? There was as an argument, or more accurately, a discussion in SF chat about this very question earlier today. Do we need to close vote such questions? If so, why? I contend that there's no better place to ask such questions, yet others contend that just because there's no better place to ask such questions doesn't mean that here's the place to ask such questions. I contend that even questions like these, that may be more about structural engineering than about systems administration, are pertinent here because the questions are about topics that sysadmins should be concerned about, even if they individually are not. Sysadmins and network admins should be worried about their systems all the way from the bricks and mortar and ventilation systems of the building, all the way to IOS and Linux and Windows. Edit: I really appreciate all the great responses, and it was hard to choose just one person to get the green checkmark... but in the end I have to admit, Wesley wins it for the Venn diagrams. System administration has, as a subset of its larger potential skills, an overlapping portion of datacenter design's skillset. Datacenter design can be a speciality, and at a scale above a couple thousand square feet probably is a speciality, but does have a set of topics that a system administrator can be reasonably expected to know. A system administrator is a generalist knowledge domain. Some sysadmins tend to focus on one thing versus another thing, and no sysadmin really looks like another. However it is self evident that a sysadmin will be working on switches, routers, databases, server OSs, firmware, hardware replacement, wiring, VOIP, firewalls, storage, HPC clusters, threat mitigation, PCI compliance, wireless signals, mobile phones, etc. and etc. Each of the above topic domains can be specialized in to such a degree that a person that does so might not be considered a sysadmin. Someone who is a VOIP engineer is... just that. A VOIP engineer. Not a sysadmin. Someone that is a storage administrator can have a depth of knowledge and a tightly scoped domain of responsibility that makes them... just that. A storage administrator. Not a sysadmin. I like to use database administrators as an example. A sysadmin, in the course of performing his duties, will have a high probability of working with databases. Maybe it's as simple as spinning up a MySQL database for a Cacti instance. Maybe it's as complex as working with replication, sharding, split tables, indexing, and query execution plans for a large application. However, there are also database administrators (DBAs) as a separate professional arena. DBAs are specialists in their field (or at least should be) and due to their constant exposure to databases and the theories and practices behind information storage and retrieval in a relational database, will have a honed domain of knowledge and speciality that is beyond a sysadmin's (typically... or perhaps ideally if not typically). They are no longer sysadmins, but DBAs. Now some sysadmins might have never, ever touched a database server. Never ran an SQL query. Never worked with anything more complex than a spreadsheet. Does that make them less of a sysadmin? No. However, just because they have never used a RDBMS does not mean that someone who has done so is a specialist and that the general skillset of database administration is outside the realm of a sysadmin. In a similar manner, datacenter design and management has the potential to be within the scope of a sysadmin. Topics like rack design, rack placement, hot and cold aisles, concrete floors, raised floors, cable plant management, ceiling types, AC sizing, AC duct placement, circuit sizing, electric voltage selection, fire retardants, physical security, generators, etc. and etc. can be part of a sysadmin's duties. It could be for a 100 square foot closet. It could be for a 1,000 square foot room or perhaps larger. If it gets much larger than 1,000 square feet, then it seems that a specialist company and set of engineers should be consulted to do the main design phase, with input from sysadmins (thus, sysadmins would still be at least a part of the design process, thus datacenter design and management would still be within scope of a sysadmin). Once you get past a certain arbitrary level of knowledge, job description, and daily duties, then somewhere along the line you become a DC manager or DC designer, in much the same way that at some point along the line you would become a DBA and not a SysAdmin, or a storage admin, or a security specialist, or a VOIP engineer, etc. Aspects of datacenter design are on topic for ServerFault and sysadmins in general. We should not consider a speciality community just yet. Yes, I know we quibble about the fracturing of StackExchange into Security, DBAs, U&L, etc. However, that's another topic. 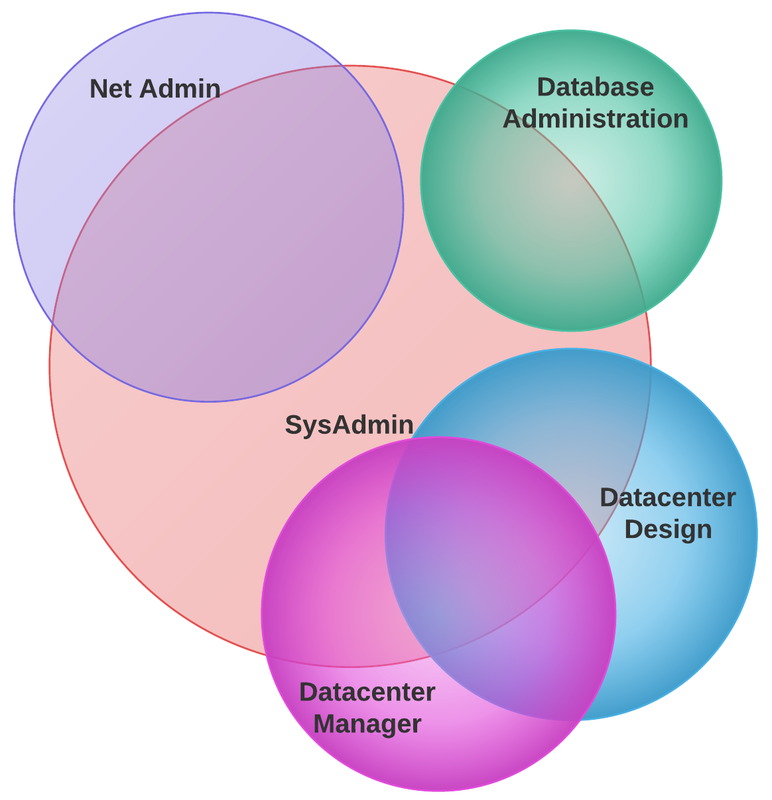 For now, while we don't have a specialist community for Datacenter designers and managers, it's still on topic here just like database administration and UNIX/Linux questions are, within a certain scope, on topic as well. Iain brings up a good point: "Datacenter design is an architecture task"
I can both agree and disagree with that. Selecting load bearing beams, rebar sizes and placement, lashings for ducts, what mix of concrete to pour, and etc. would be for the architectural engineers. Placement of racks, choice of voltages, runs of cable, sizing cooling systems, types of battery switchovers could be something a sysadmin does, but could also be part of an architectural engineer / datacenter designer's job. A sysadmin doesn't have to be bonded, licensed, or otherwise take a state-official engineering exam to make most of those decisions (depending on locality of course). So while it's not necessarily a part of a sysadmin's job, it could be within the scope and by experience is within the scope. I think part of the controversy is the scale of what we think of as a "datacenter." It can mean anything from a few hundred square foot place for a handful of racks, to a million square foot, billion dollar city-state of a complex. A sysadmin is unlikely to have much to say about the larger datacenters, or speciality structures for high density, HPC uses. However for the approximately 1,000 to 2,000 square foot server rooms / small datacenters, sysadmins are, in my experience, normally the ones who have a large part in the actual design of those rooms, even to the point of CADing out placement of racks and thinking about air flow, etc. Converting a few hundred to few thousand foot segment of office space, warehouse, basement, or what-have-you into a "datacenter" complete with raised floor, tons of cooling, backup power, generators, fuel contracts, wiring, voltage selection, etc. has, once again only in my experience, been largely up to the sysadmins of an organization and is not technically or (sometimes) legally an architectural/engineering issue other than "call the structural engineer to see if the floor can hold us!" So there are definitely portions of work in DC design that shouldn't be touched by sysadmins, most notably the ones where law is involved, and structural engineering is needed. 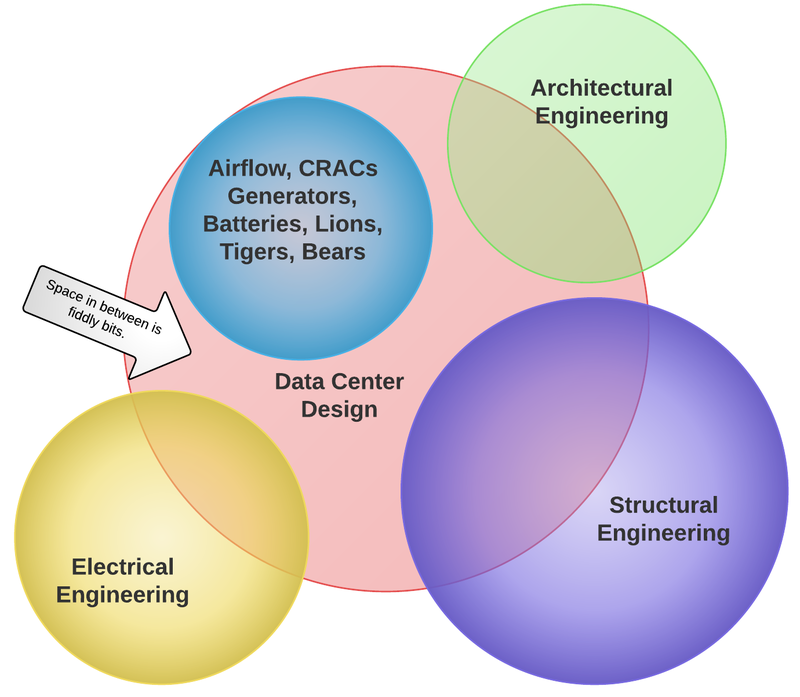 But datacenter design is only partly about those things. Yes, stay away from decisions regarding laws about doors, precise placement of anti-fire systems, locks, etc. But the pink stuff, and the blue stuff in the diagram above are things that can, by and large, be touched by a sysadmin or the final decisions can be made by sysadmins (thus making sysadmins in-part designers). Not the physical installation of a CRAC or the circuit panels, but the decision on how much cooling, how much power, and even specific vendors to go with. Not necessarily cable pulling (although, how many sysadmins have pulled cable in their life? Can I see a count of hands? Uh-huh. A lot of us wire fishers, huh) but choosing cable types, amounts, and even plant paths to account for growth in IDFs outwards from the MDF. Certainly I'm not thinking about monster DCs, but rather a few hundred to thousand square feet of server room / datacenter space. Apple-sized DCs -- no way. I've seen a few of these questions come and go over the years, and they have a disturbing tendency to get closed as NARQ -- Too Broad. Which is sad, since there is a nice corpus of knowledge to tap out there. A 5-rack datacenter is a different animal than a 2500 sq/ft facility, and the challenges are correspondingly harder, so we definitely have a diversity of environment to work with. The trick is scoping the questions narrow enough they'll get answered. I think they're topical, honestly. To elaborate a bit more, I think there is definitely a cut-off point when the sysadmin should be involved and when hire a professional kicks in. When designing such a facility, be it a 2 rack closet or a 5MW facility, you need at least one person familiar with correct datacenter design involved with the project. Dedicated datacenter architects do exist and you can even hire them, but that doesn't mean they'll be contacted by whomever you're working for. Oh, your servers aren't used as much at night and weekends, so they'll need less A/C. Um, no. No they aren't. We run those babies at full tilt 24/7. This is a mythology that seems common in office-building engineers: IT equipment directly supports the people in the building, and gets turned off or goes low-power-mode when the people leave. Speaking knowledgeably about airflow and power allows you to be more effective in urging the worst of the bad ideas to not make it into the final build. Ideally, you'd have someone actually experienced in that kind of engineering, but in lieu of that you can be the shoulder devil for the trained but inexperienced person who is having to draw the diagrams and order the parts. ServerFault can act as that shoulder-devil if you let us. We have enough of the right kind of people to poke holes in plans and sound like we know what we're doing while doing so. The question that caused the discussion is in reality a shopping question because the OP is looking for software that doesn't take years of training to understand. Which kind of makes my point for me. I don't understand how designing a datacenter is a sysadmin et al task. We may have input to the requirements phase, some oversight of the design but we wouldn't really design the building. Building design is a complex subject, in the UK architects study for at least 5 years before they get their degree and 2 years post graduate before they can call themselves architects. It's an interesting subject but it's not our job and should be left to professionals in the field.